In the previous post we saw how to install and uninstall the Windows service of our demo project. Currently the service doesn’t do anything as there’s no method implementation anywhere but it’s good that we can safely install and uninstall it. I need to stress the importance of logging in a Windows service. First of all it’s vital to log at least some activity in any real business application so that you can trace what your users are doing and find the source of exceptions. It’s even more important to have logging in place for an application with no user interface such as a Windows service. A Windows service cannot even send messages to a command prompt for you to see during testing. If you have no logging in place then you’ll be wondering what is going on if the service doesn’t perform its job. We won’t build a full-blown logging system here, just a simplified file-based one. You can read more about logging in two blog posts: an introduction and a concrete example with log4net. In a real application you’d use a professional tool to log to a file but that would unnecessarily sidetrack us now. Also, we could take the level of abstraction even further. Note that FileBasedLoggingService directly uses objects like File and FileInfo which make it difficult to test the methods in this class. A more complete solution would require us to separate out the concrete file-based operations to an abstraction. We’ll leave the implementation as it is for now. You can clean up this code if you’d like to as a homework. You can take a look at this post where I go through how to factor out file-related operations. It ties in well with what I’ve written in this paragraph. Let’s add this as a dependency to HttpJobRunner. At present HttpJobRunner- the partial class that inherits from ServiceBase – is quite empty with a constructor that calls upon InitializeComponent and two empty overridden methods. 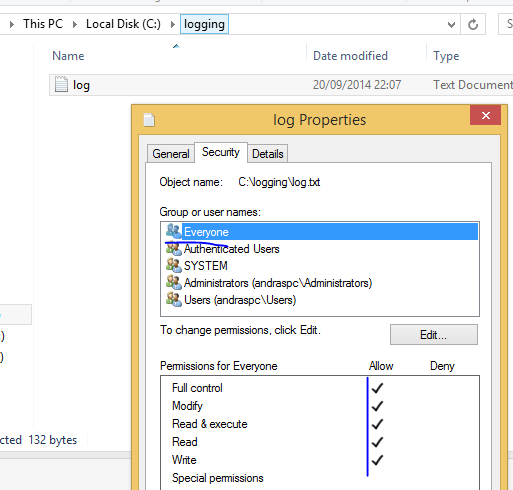 Make sure you insert the full path of the log file that you created before in the FileBasedLoggingService constructor. Great, we have some logging in place. This doesn’t of course solve the problem of interrupted jobs but at least we know that something noteworthy has happened which can be the cause of a failed job. It is your responsibility to make your service “clever” enough to pick up an interrupted job when it’s restarted. In our example the service could check all jobs that have been started but not yet finished and start from there – or simply restart the job from the beginning. However, that’s beyond the scope of this series, but it’s still good to know about this issue. Before we finish this post let’s add one more method to HttpJobRunner. The goal is that the service is never restarted due to an unhandled exception. 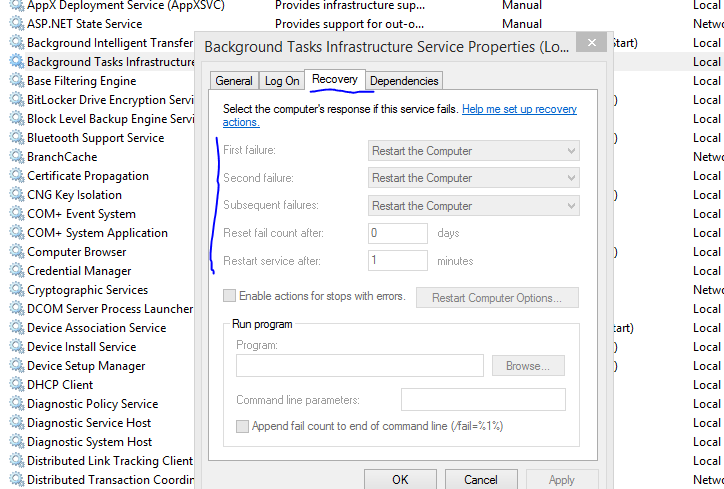 If there’s an uncaught exception somewhere during the code execution the the service will fail and act according to the failure policy, such as “Restart the service” in our case. However, as noted above service restarts can be detrimental. It’s not always possible to catch all exceptions in a large code base even if you put try-catch clauses everywhere. There’s a solution to catch all uncaught exceptions in a Windows service though. I mentioned it already in this short post on threading. We’ll reuse much of it here. This is enough for now. We’ll continue with the service implementation in the next post. 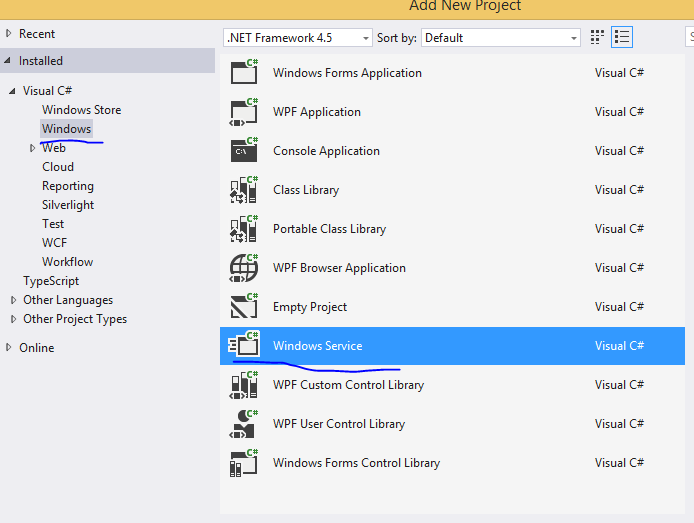 In the previous post we went through the basics of a Windows Service. We saw how to set its properties in code. In this post we’ll see how the service can be installed. The first option is a bit cumbersome I think. You have to type in the uninstall and install commands to InstallUtil in a command prompt and provide the necessary command parameters. The third option, as far as I can remember, is not by default suitable for installing Windows services. The InstallShield wizard is meant to install “normal” desktop applications, like games. The last time I used the InstallShield project type I had to add a plugin from WiX in order to make it work with Windows services and it wasn’t fun. We’ll instead go with the second option. There’s a definitive advantage with option 2 compared to the other ones. In a more advanced “enterprise” scenario you’ll likely store your code in some repository like SVN or GitHub. Then the code will be exported to a Continuous Deployment or Continuous Integration tool such as Jenkins or TeamCity. These tools can run the installation script to automatically install the Windows service as part of the automated deployment process. The scripts are very simple. We’ll have one for uninstalling a service and one for installing it. Some of the process will be manual but it can be automated with batch files in an automatic deployment scenario. When we install the Windows service we have to make sure that any existing service of the same name is uninstalled otherwise we’ll get an exception hence the need for an uninstaller. We call InstallUtil, instruct it to install a service with the ‘i’ flag. The install command refers to a folder we haven’t set up yet but will do it soon. Then, as hinted at in the previous post we’ll add an extra call to set the failure mode to restart the service. Be exact with the arguments, including the whitespaces: “reset= 0” and not “reset = 0” or “reset =0”. In my experience putting the space in the wrong position will result in a failure. We then call “pause” to leave the command prompt open so that we can read the outcome. You can later remove that command so that the window closes itself automatically. We’ll save the file in the same directory where Demo.HttpJobRunner resides. If you’re not sure where it is then right click the Windows service project in the solution explorer and click Open Folder in File Explorer. That is the folder where we’ll save the file we wrote in Notepad. Save the file as “_installer.bat”. 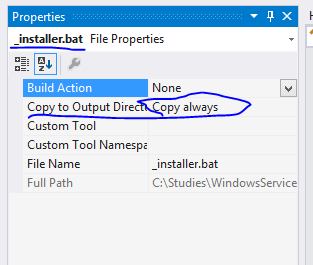 We do this so that the _installer.bat file is also copied to the deploy folder. Note that the _installer.bat and _uninstaller.bat files refer to Program Files (x86) but if you opted for Program Files then make sure to update the installer files accordingly. Copy all files except for _installer.bat and _uninstaller.bat one level up, i.e. under “WindowsServiceDemo”. 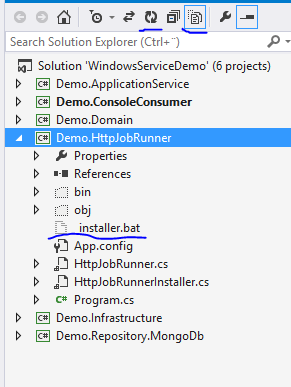 Then return to Deploy and run _installer.bat as an Administrator. View the notices on the Command prompt. It might tell you that the OnCommitted event has failed but the exception message is misleading I think: you haven’t specified a process file name or something similar. I’ve seen it before, I’m not 100% sure why it happens but I’m pretty certain that it’s because the Process object has not enough rights to run the “sc” command. It’s OK, the installer script will take care of that. In case you don’t see any exceptions from the OnCommitted phase in the output then you can remove the extra call to “sc” in the _installer.bat file. Otherwise just keep it and remove the SetRecoveryOptions method from HttpJobRunnerInstaller if you wish. The service doesn’t do anything yet when installed because we left HttpJobRunner.cs untouched. In the next post we’ll start adding some action to the Windows Service. In the previous post of this series we added the console UI to the application. The user can now add a HttpJob to the MongoDb database but there’s no job handler yet. In this post we’ll start building the Windows service which will do just that. I’ll assume you have no or very limited knowledge of Windows services so I’ll go through this at quite a slow pace. We’ll be working on the demo project we’ve been building so far so have it ready in Visual Studio 2012/2013. You’ll recognise App.config probably. As the Windows Service will be a standalone application it must have its own configuration file with its own settings, connection strings etc. It won’t be able to read the app.config file of Demo.ConsoleConsumer of course. This small file contains code required to properly run the service, we won’t change anything in there. These methods are triggered when the service is started and stopped. We’ll return to these methods in the next post. The service name is not the same as the display name. The service name is how Windows can find the service. Right-click a service and select Properties. “Name” corresponds to DisplayName. Without this code the service would be sitting inactive after the installation. Note the following: it requires administrator rights to change the status of a Windows service through “sc”. 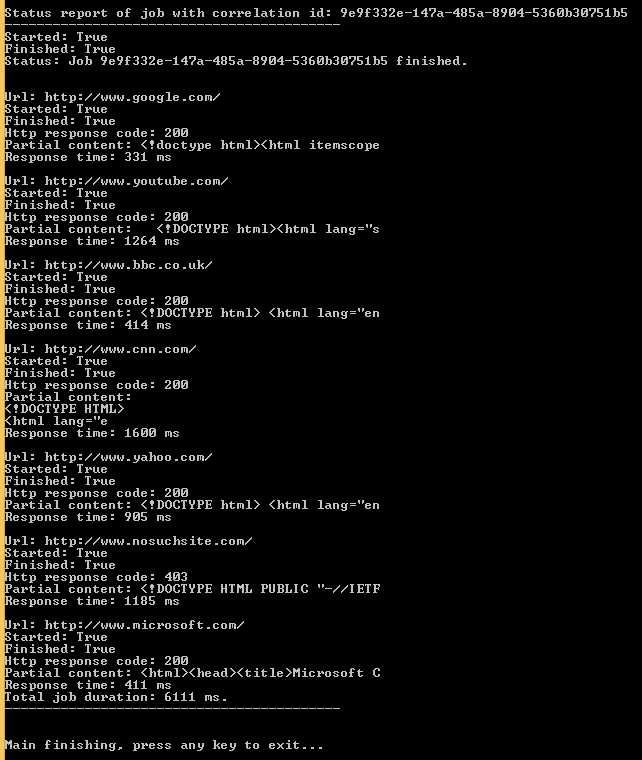 BTW “sc” refers to c:\windows\system32\sc.exe which allows the manipulation of Windows services in a command prompt. So it is possible that if we in the next module run the installation script then the “OnCommitted” phase will fail even if we run the script as an administrator. The reason is that the Process object itself won’t have admin rights. We’ll add an extra safety in the installation script to account for that possibility. The outcome depends on the UCL settings. You might think that the SetRecoveryOptions method is then not needed if we do the same in the script later. I’ll leave it as it is so that you see how it can be done in code and you can decide how to set up your installation options. We’re done with the basics. There are many other methods that you can override in the installer. Just type “override” in the editor and press Space. You’ll get a range of methods that you can override to tweak what should happen during the installation process. Change the ServiceName to “HttpJobRunner” here as well otherwise messages logged to the Event Log will appear under the name of “Service1”. If you type “this.” in the editor then IntelliSense will give you all the properties that you can set. Some interesting ones are those whose name starts with “Can”, such as “CanShutDown”. 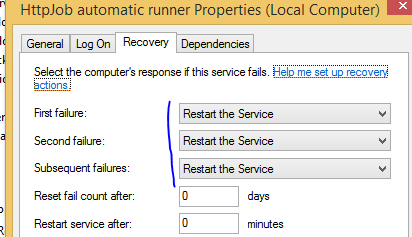 You can specify if the service can be paused, shut down or stopped. In case you’re looking for a property that you cannot set through the installer then it’s a safe bet that you’ll find it here. This will be enough of the basics. We’ll continue with the installation in the next post. In the previous post we built the Domain and Repository layers of the demo app. We’ll now build the application service layer that connects the two with the consumer layer which we’ll build in the next post. Normally the consumer layer, such as a Web UI should not directly contact the repository for its data. The application service is responsible for joining all necessary repositories and other services to provide the data that the consumer layer needs to show. We’ll build upon the demo app we’ve been working on so far in this series so have it ready in Visual Studio. Before we begin we’ll need two new elements in the Infrastructure layer. You’ll recall from the previous post that the abstract MongoDbRepository class will need an IDatabaseConnectionSettingsService interface to read the connection string and database name. We’ll store those in the app.config file which we’ll create in the next post. However, these settings could potentially be stored in various different places: a database, a web service, etc. We saw in this post how reading settings can be hidden behind an interface. We’ll take a similar approach here. Normally settings come in name-value pairs so we pass some key value and expect the corresponding setting value back. We’ll see shortly how this abstraction is used. So we’ll store the connection string with the key “HttpJobsConnectionString” and the database name with the key “HttpJobsDatabaseName”. Remember, these settings could be stored anywhere hence the need to inject the service which actually reads the settings. We’ll fill in the app settings file shortly. You’ll recognise the properties from the JobUrl domain object: we’ll need to read the HTTP response code, the HTML content and the response time from a single URL call. Again, it takes time to carry out a job so we’ll go for asynchronous calls here as well. If you don’t understand why these methods are meant to be asynchronous and why they return Task objects then start here. I think the code is really simple and straightforward, there’s nothing magic in it. We initiate a HTTP request through the injected IHttpService service and note the time between the start and end of the call. 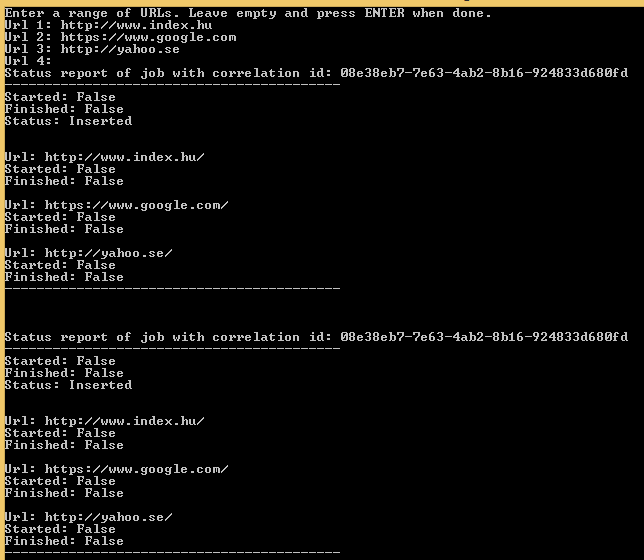 This might not be the most precise way to measure the response time of a URL but it’s good enough for the demo. Then we populate the HttpContent and HttpResponseCode properties of the JobUrlProcessResponse object based on the result stored in MakeHttpCallResponse. In the Execute method we first update the job status to Started. Then we go through each URL in the UrlsToRun list of the HttpJob object. In the for-each loop we update the status of the URL to started and then save the HTTP response code and content. We also add the response time of the URL to the total response time of the job. Finally we update the job status to Finished and assign the total response time to the appropriate property. That’s it, we have the service layer ready to go. In the next post we’ll build the consumer layer which will be a simple Console app.